Last week I did 10 metres of hemming for Maria's new kruseler. It will be based on a veil depicted on a candelier from Lemgo, Germany, dated shortly before 1400. You can find other examples of this style of frilled veil here. The next step will be making the pattern for the veil itself. I'll probably get round to that only in two weeks, since the fabric I'll be using is still in Holland (and I am back in Belgium), my bags were already so heavily packed yesterday that I couldn't fit in the linen. I've been waiting for samples from www.naturtuche.de, to pick a fabric for a new fancy dress, and yesterday they arrived! I will be choosing this pretty madder red fine twill. It goes so well together with the purse I'm working on now. 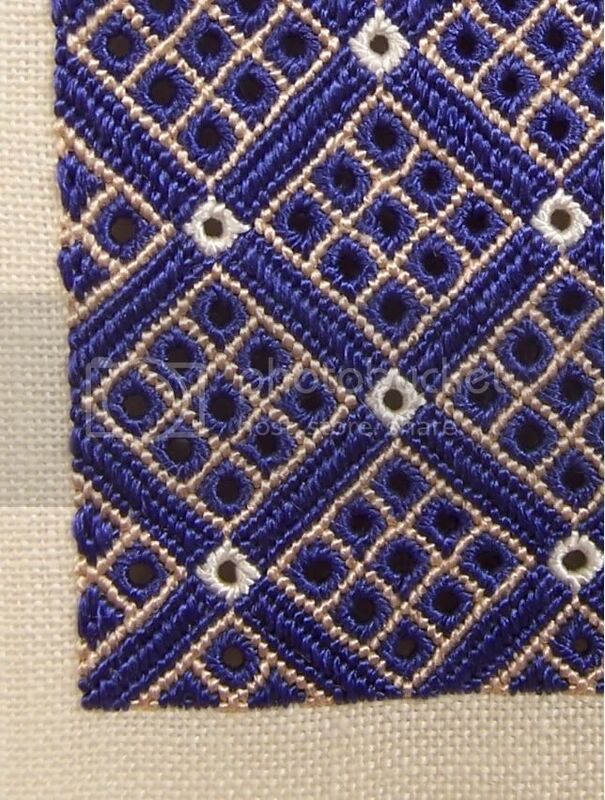 The blue silk will be used for tassels on the purse. The red dress will have brass buttons on the front and on the lower arms. 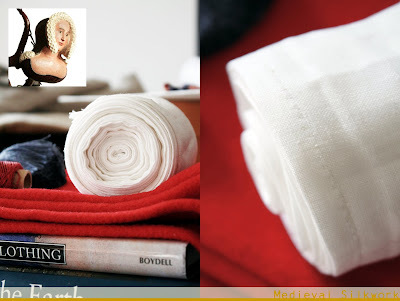 I am also keeping my eyes open for a pretty light blue wool, to make an over-dress from. I have been wanting an over-dress with buttons all the way from the neckline to the hem for some time now (five years or so? ), so it's getting about time I do something about it! This new outfit will also involve a new frilled veil with gold thread edges, a new belt with gilt mounts, a chapelet with mounts, some jewelry, new shoes, a pair of pattens... Oh well, a girl can dream, right? 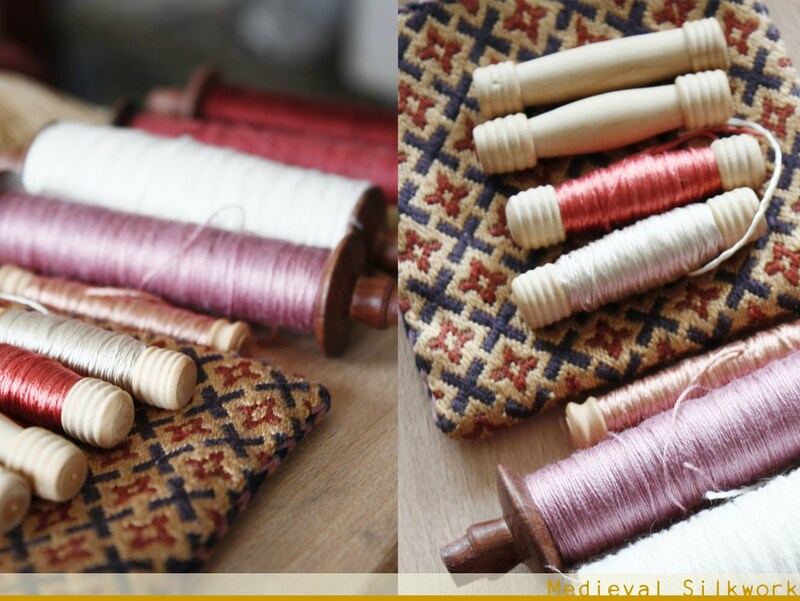 When we were in Nijmegen at the end of August, I bought five little boxwood thread reels from Bikkel & Been. Monica, who made them, told me they were based on a London find, that was originally in bone. They are perfect for fine embroidery silks, because boxwood has a very smooth surface, that won't damage your silk. Have a look at Monica's website, they make lovely things. For now they only have a Dutch site, but when I last spoke to her she told me they are in the process of building a new site that will also have English pages. Recently my attention was drawn again to this purse from Tongeren, Belgium (see more info and images here). 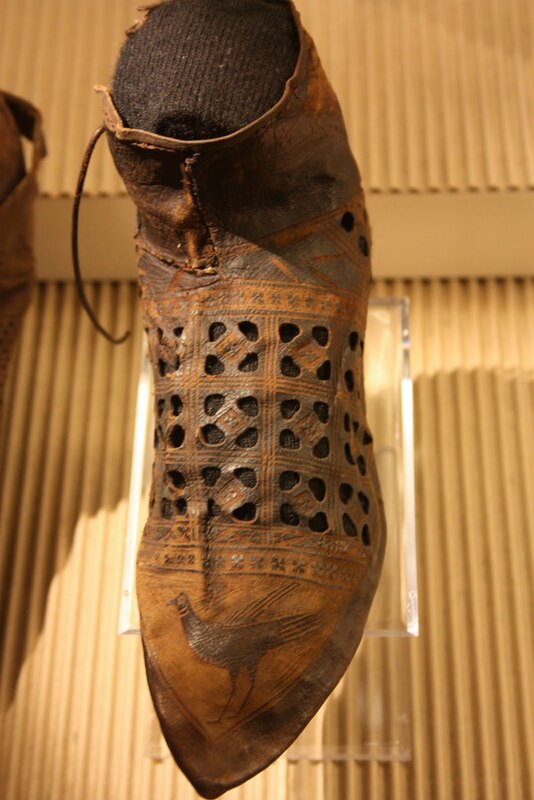 It is dated to 1276-1300. It exists of a woollen ground fabric - as does this purse I posted about earlier this week - with silk and metal thread embroidery. 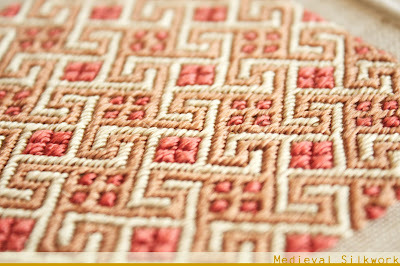 The embroidery is a mix of brick stitch and eyelet stitches. Tristan from Taschen did a pattern redaction of this purse, with which I do not fully agree (I have been wanting to do a redaction myself for some time, I promise I'll do it soonish). You can find it here. His finished piece is gorgeous too! Also have a look at this detail shot. 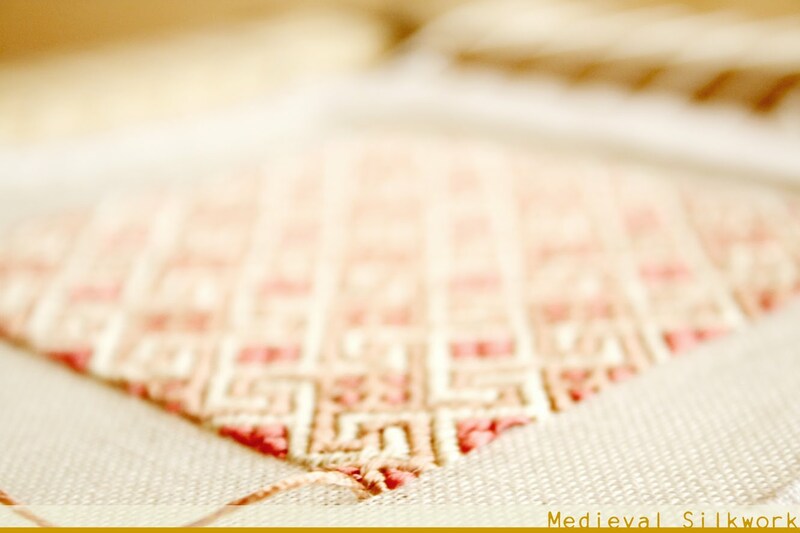 For a long time I have thought this was the only piece of embroidery with eyelet stitches from the medieval period in Europe. Apparently not! Just this week I was browsing the website of the Needleworkers Guild of the West Kingdom, where I bumped into this fabulous piece of eyelet embroidery here. 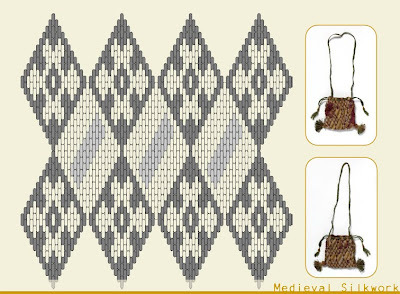 As opposed to the purse from Tongeren this embroidery pattern is built up from eyelet stitch only. The colour photo by Catrijn shows that the piece was done in red, blue and yellow/green silk, and metalic thread. It is situated in the Uppsala Cathedral Museum. Has anyone got more information on this piece of embroidery, or interesting literature about it? Recommendations are always welcome. I kind of forgot to tell you all that my final thesis has been accessible online for some time now! 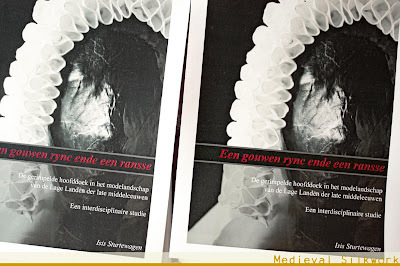 You will find it here, at the website of the Ghent University Library. 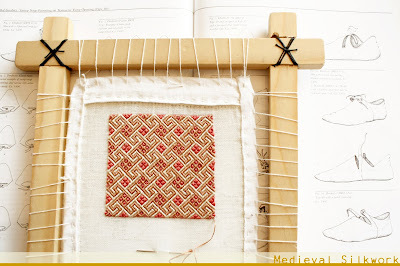 For your pleasure I also made pages on the blog where articles, tutorials and embroidery patterns will be grouped. That way it will be more easy to find the information you need! You will also find a link to my thesis on the articles page. 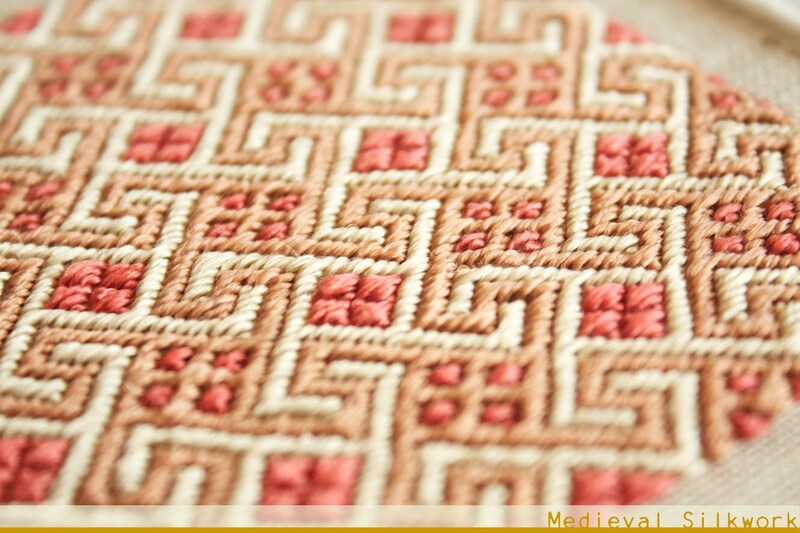 This very small embroidered pouch was found in the Eglise Saint-Vincent in Soignies, Belgium. It dates back to the 13th or 14th century (alas I couldn't find a more precise date). 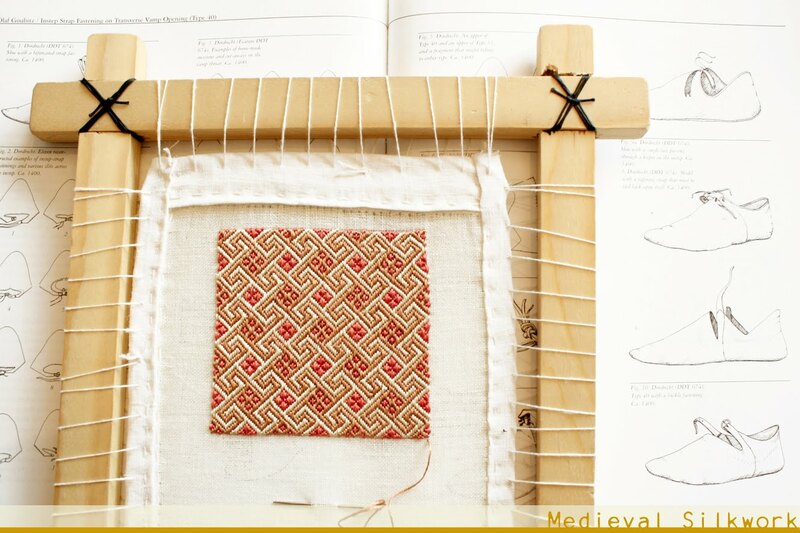 It is embroidered in silk on a woollen tabby weave canvas. The colours now appear to be dark red, white/yellow and orange/brown. The drawstrings in finger loop braiding are made using a green silk. In the tassels red and green silk have been combined. 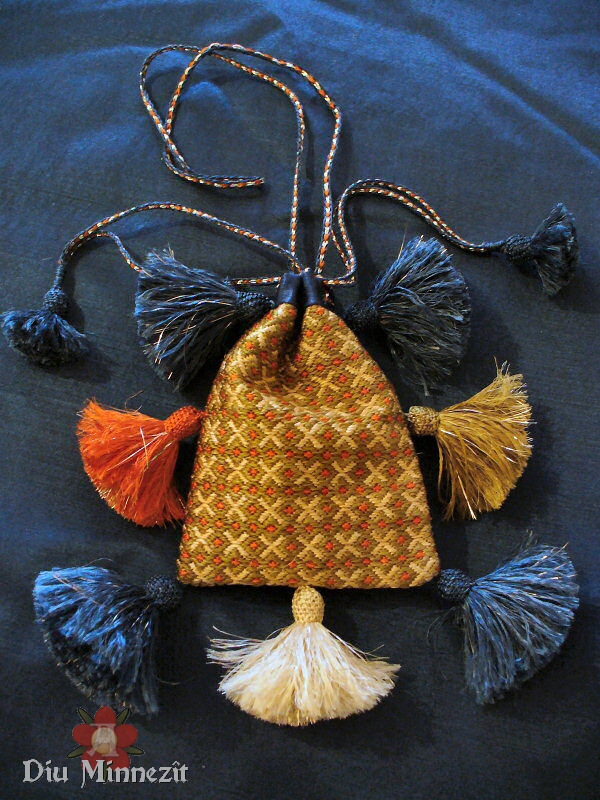 The tassels are embellished with red silk turk’s head knots. The opening of the pouch has been decorated with loop braids. You can find a pattern redaction and information sheet here. It's been a while since I last posted about this project! I am now a little over half way with the embroidery (I made some more progress since these photos were taken). I want to finish it this winter, because I want to start a new embroidery project next season wich will involve naturally dyed filament silk, hopefully, when I get round to dyeing this winter. 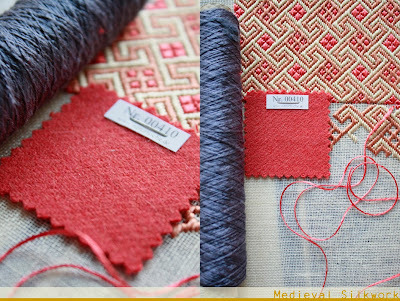 I have been wanting to work with naturally dyed silk for long, but couldn't find filament silk in naturel dyes readily available, only spun silk it seems. But after seeing this wonderfull purse by Miriam of Diu Minnezit, I decided to dye my own.